As I write this quick post, a strong bow-echo is racing across northern Minnesota and northern Wisconsin. The National Weather Service Forecast Office in Duluth, MN issued several large warnings (3rd largest NWS warning and 9th largest NWS warning) for the areas along and ahead of the approaching bow echo. I’ll leave the debate over whether issuing such large warnings are good for service to a later date. Instead, I want to take a quick moment to highlight what I perceive to be a deficiency in how the NWS does it’s verification. This deficiency actually rewards forecasters for issuing larger warnings, such as those issued tonight by NWS Duluth. Consider the three warnings below, all which were valid at the same time. First, let’s assume that a severe weather report occurs in the domain shown at the time this image was taken. Next, let’s assume that a severe weather report occurs at any of the areas denoted with a “1″. In this case the single storm report verifies the single warning that contains the report. However, if a severe weather report occurs at any of the areas denoted with a “2″, that single report verifies both warnings that contain the report. Thus, a single report verifies two warnings! 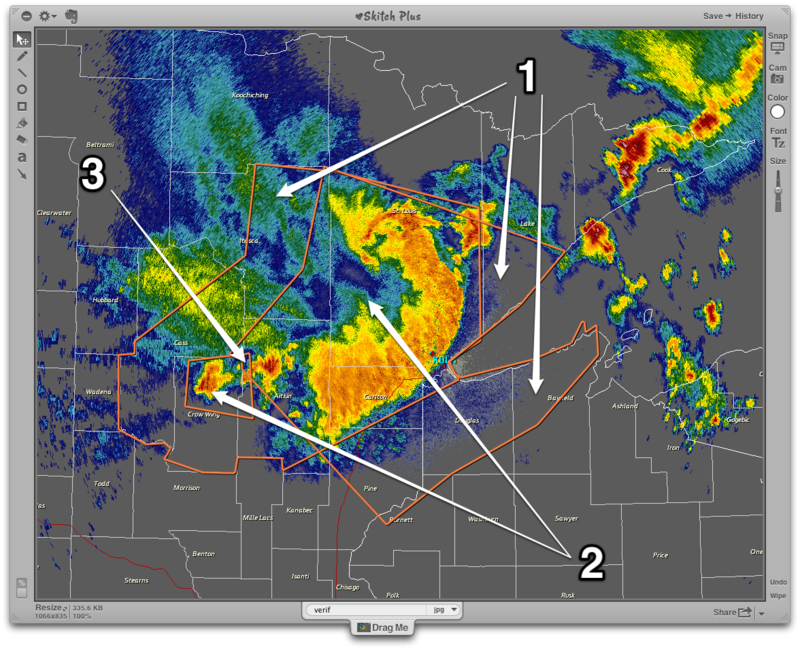 Now, consider the scenario in which a single severe weather report occurrs at location identified with a “3″. In this case, the single report would verify all three warnings that contains that single report! So, what does this mean? The larger a warning, the more area in which a report can occur to verify the entire warning. Furthermore, if warnings overlap each other, a single report can verify multiple warnings. Thus, in terms of determining the NWS’s/office’s/forecaster’s verification scores, each are actually rewarded for engaging in this practice. Now, I’m not a NWS forecaster, nor have I ever been. I cannot say (and highly doubt) that gaming the verification system is consciously thought of in the heat of the warning process. However, it highlights what I consider a short-coming of the NWS’ verification process; one that rewards larger warnings in a time in which storm-based warnings were designed to promote smaller warnings.